Now Big G is in trouble! The three invading space monsters are now super-charged and ready to kill Godzilla. Ally Red Ronin has gotten his head chopped clean off, and 12-year-old pilot Robert lies unconscious and in danger. Luckily SHIELD people have finally shown up to give us smart remarks on the impending action. If you need a refresher on who’s-who, check out the Godzilla Marvel Splash Page, and feel free to check out the rest of March of Godzilla 2013! Tamara Hasioka and Jimmy Woo risk their lives to grab Robert from the battle, as he’s lying unconscious in Red Ronin’s severed head. 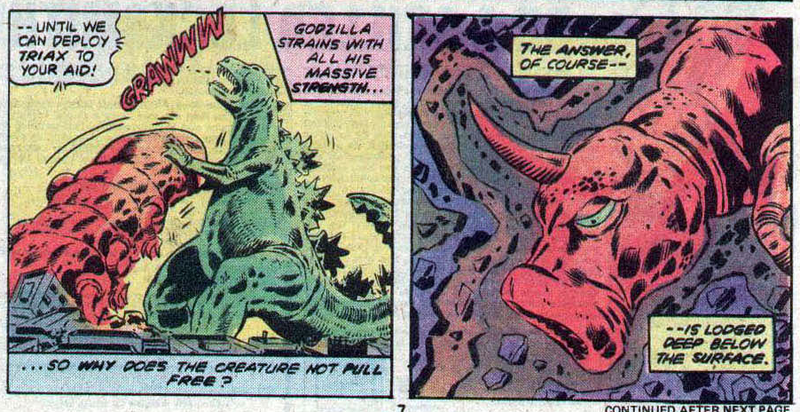 They succeed, because I really doubt the Godzilla comic will kill off their only child character. 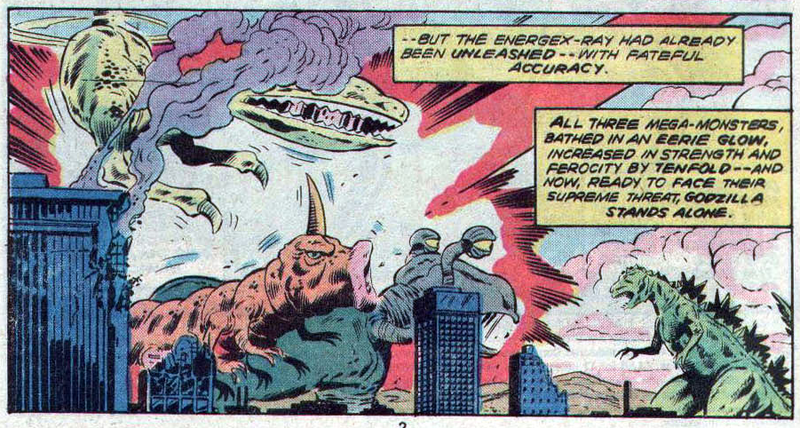 Thanks to the Mega-Monsters having received the super-charging Energex-ray, Godzilla is outnumbered and outgunned, and starts to get stomped. The three super-powered Mega-Monsters pound him like a red-headed dinosaur step-child. Dum Dum and Gabe grab SHIELD ships to fly in and help the battle. 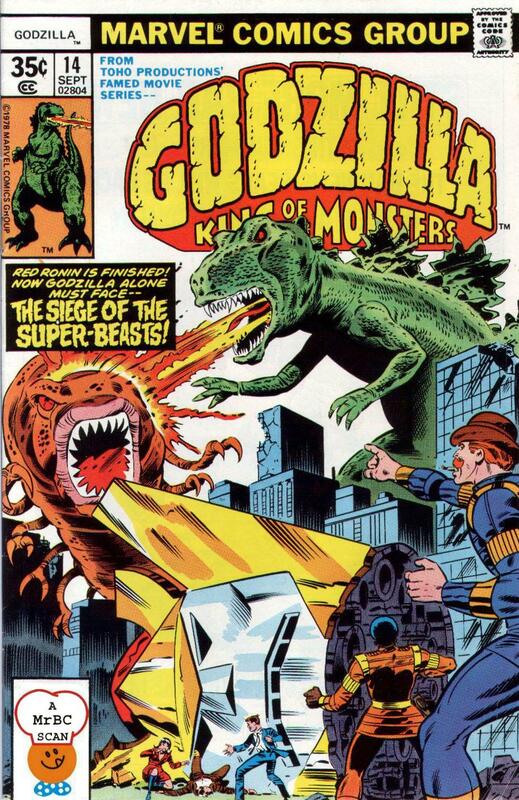 Their distractions allows Godzilla to be able to kill Krollar! 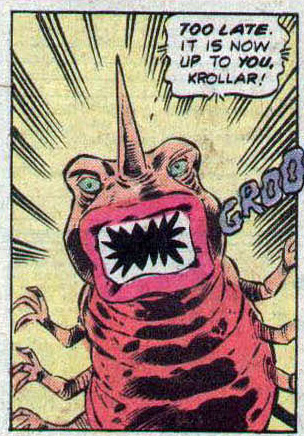 Take that, Krollar, you were the worst of these monsters! 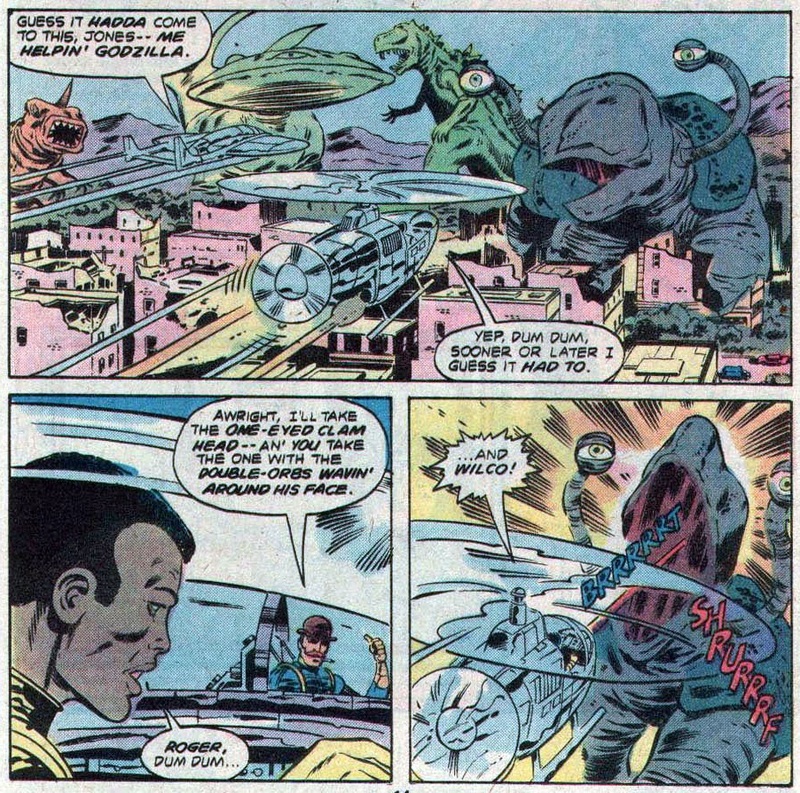 Godzilla sets his sights on Triax, who soon is killed dead as well. Triax was totally arrogant, so au revoir to that guy. 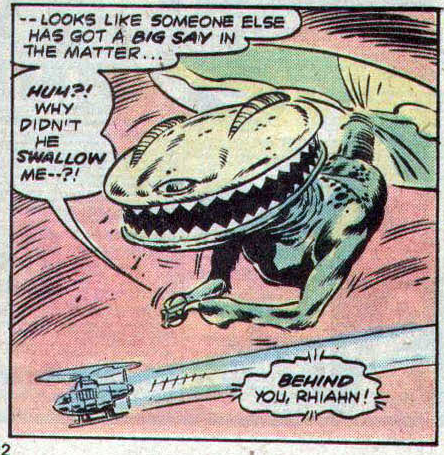 Rhiahn chomps on Dum Dum’s ship, but doesn’t swallow, and Dum Dum gets knocked out of his mouth…into Godzilla’s hand! 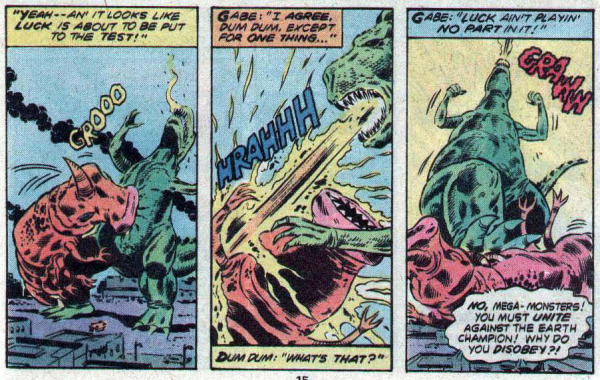 Godzilla just puts Dum Dum on the ground and then fights Rhiahn. Rhiahn tries to chop off Godzilla’s head, but Godzilla moves Rhiahn’s blades so the Mega-Monster beheads himself! On the Moon, the Betas all die from no air. Meanwhile, the Megans decide that since they can’t conquer Earth, they are too tired to war with the Betans any more. It’s peace through exhaustion! Or just being poor. Well, let’s take our victories however we can get them. 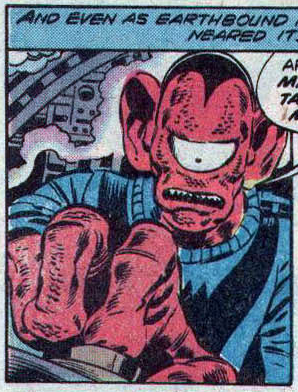 Luckily, the Betans and the Megans were never seen again in Marvel comics, so we can assume that they broke both their economies so much they can’t even afford space travel to make background cameos! Next time — Godzilla goes somewhere you will never expect! No, not there, I said somewhere you don’t expect! Stop guessing, just find out next time. He’s angry he forgot the sunscreen! 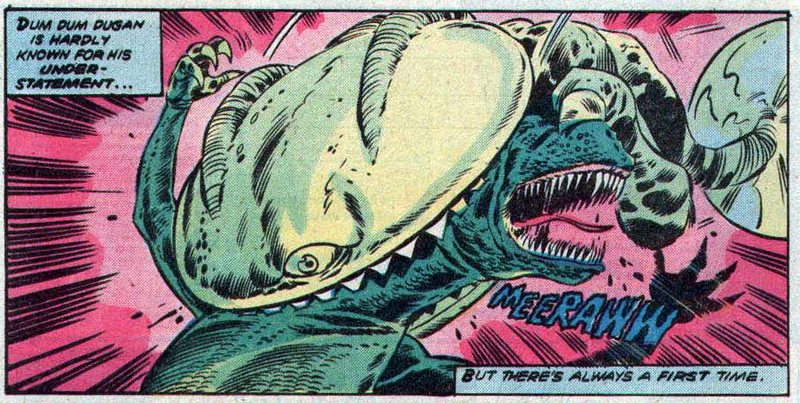 You got to keep your head when fighting Godzilla!